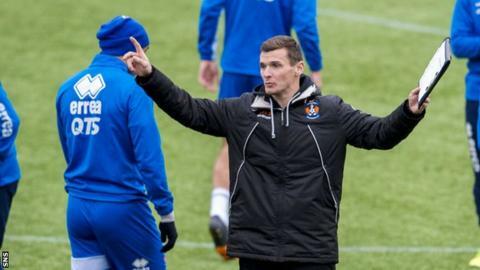 Lee McCulloch has ruled himself out of taking on the managerial role at Kilmarnock permanently. The former Rangers midfielder, in caretaker charge following Gary Locke's resignation, gave a flat "no" when asked if he wanted the job. "It's a day at a time for me," the 37-year-old former Scotland international told BBC Scotland. "I'll be in charge for Saturday's game at Fir Park and then we'll see what happens. I am quite happy with that." Kilmarnock will interview former Scotland international Graham Alexander for the vacancy within the next 24 hours. McCulloch led the Ayrshire side to a Scottish Cup replay with a goalless draw against Rangers at Ibrox on Saturday. "I'm sure the board will make the right appointment," he said. "They don't want to be rushed into it. They will do what's right for the fans and the club. "I try not to get involved in anything other than the team on the pitch and I think that's the way it should be." Asked if he might want the job until the end of the season should relegation-threatened Kilmarnock beat Motherwell at the weekend, he replied. "I doubt that. "The board know my feelings. They know exactly where I stand and I know where they stand."